The Bermuda Sailors’ Home, begun by several Bermudian philanthropists of a nautical and patriotic nature, was founded in 1927 with its Headquarters originally in the Old Town of St. George. It move to Hamilton in 1930 and has occupied its present premises (made possible by generous gifts over the years) since 1963. The Bermuda Sailors’ Home Inc, was incorporated by Act of Parliament in 1946 and is one of Bermuda’s oldest charities. 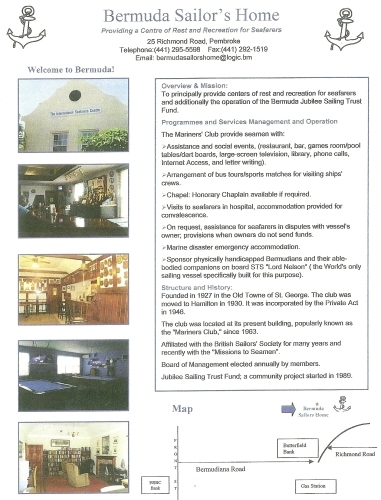 The purposes of the Home and its social club “The Mariners’ Club” are stated as being created for “the provision of recreation centres and homes for and the promotion of happiness and well-being of all seafarers (being) authorised to engage in charitable and benevolent works of all descriptions within these Islands in furtherance of the said purposes." The Home is affiliated with the Mission to Seafarers’ (the Flying Angel), Stella Maris and the British & International Sailors’ Society. The President of the Mission to Seafarers’ HRH The Princess Royal visited the Home in 1999 and again in 2006. Bishop Bill Down the former Bishop of Bermuda was previously The Secretary General of The Mission to Seaman (as it then was) worldwide. Past Chairmen of the Home have been drawn from the Mercantile Marine, the Royal Navy and others with a deep and abiding love of the sea and a care for all who go down to the sea in ships.